As I mentioned in my last post, I have been trying to get through all of my food before we move. I had almost a full jar of tahini leftover and so it was high on my priority list of things to use up. I was also invited to a potluck BBQ. As soon as I put two and two together, I knew what I had to make. 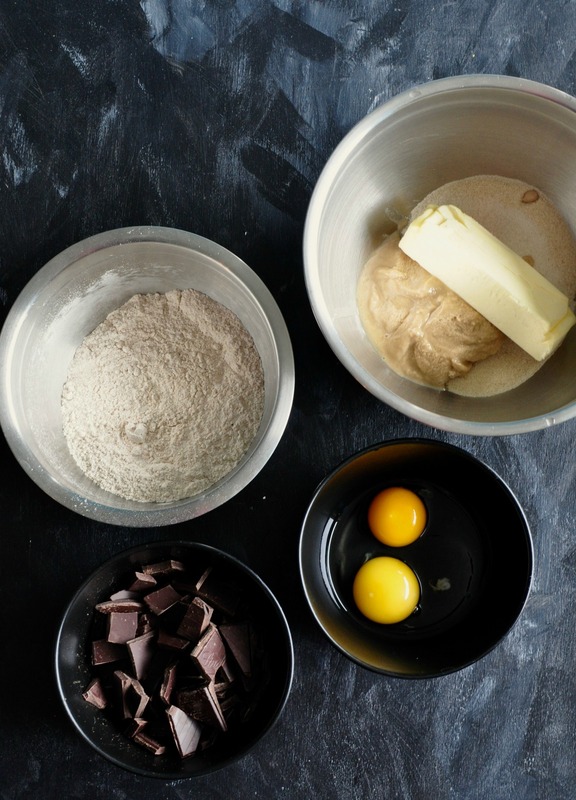 I had spotted this recipe for tahini chocolate chip cookies on Molly Yeh’s website a little while ago. I knew I wanted to make them but I also knew that they were a very dangerous snack to have around the apartment. The type of snack that I would eat until I felt vaguely ill (but deeply content) and that was best shared with others. And so, I used my last stick of butter, my last bit of sugar, and my final cups of flour to make these cookies. And I am happy to report that I don’t think I could have used the last of all of my baking ingredients in a better way. These are the perfect cookie for a potluck. Not only because they are delicious (more like that in a second) but because they require a bit of planning. 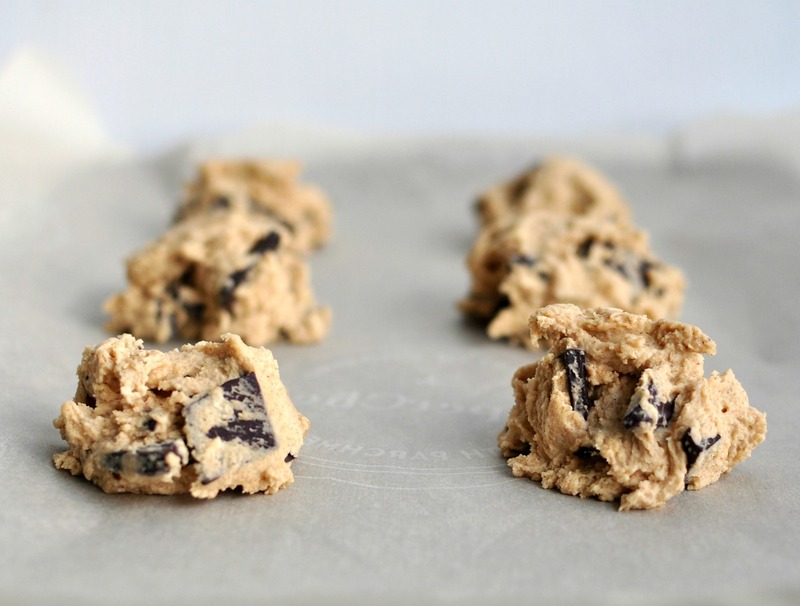 They require some softened butter, which means you have to leave your stick on the counter for a few hours and they require 12 hours in the freezer to allow the gluten in the flour to relax and the cookies to come out super soft and chewy. Last, you have to make sure that the cookies are soft and look under-baked when you take them out of the oven and wait a whole 20 minutes to let them set before you can dig in (this is the hardest of all of the waiting steps). so it’s definitely good to keep these in the back of your mind for when you know you’re going to need some cookies in a few days. The good news is that once the dough is frozen, you can bake off as many as you’d like, whenever you’d like. 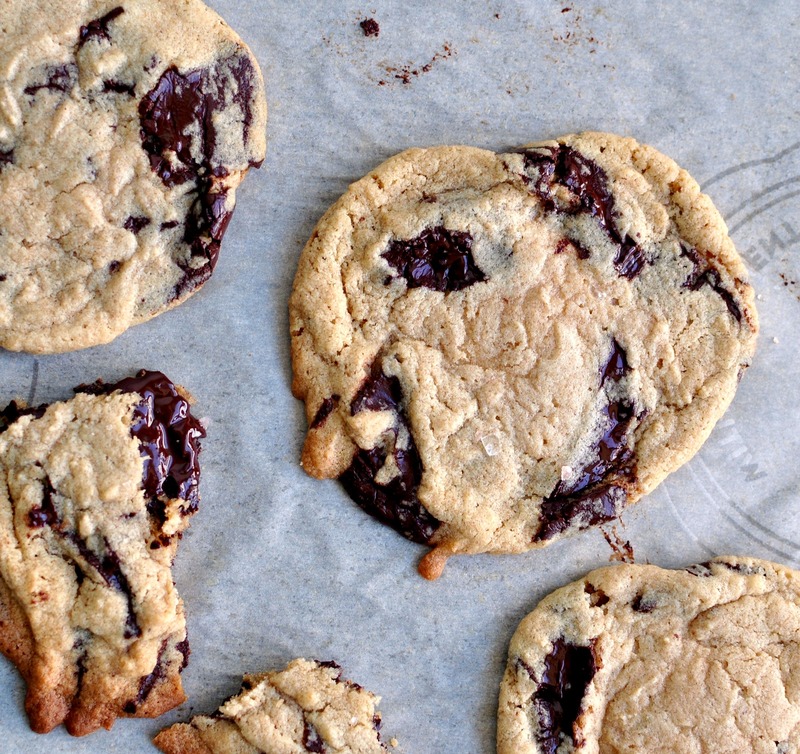 It’s probably not a terrible idea to make these cookies up to the point when you freeze them, and have warm, gooey chocolate chip cookies a short bake away whenever you need (this also gets rid of the problem of being irresistibly drawn to eating all 12 of these giant cookies at once). I have to admit I was very nervous mid-way through baking these cookies. I peeked in the oven to see what looked like a puddle of cookie dough and I told my boyfriend that they were a fail. Thankfully I diligently waited another 8 minutes and opened the oven to giant cookies that looked undercooked but twenty minutes later firmed up to be perfect. 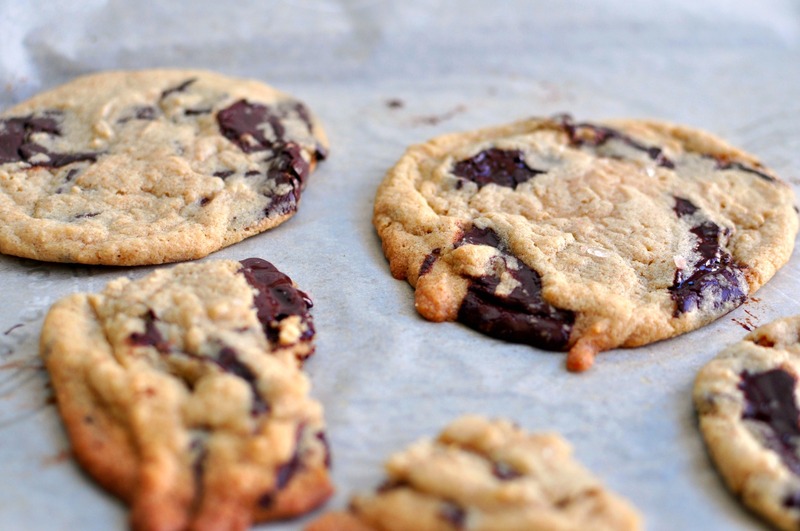 The soft, chewy dough is barely held together by the puddles of dark chocolate that stud the cookies. The edges turn lightly brown and crispy and there is a very subtle nuttiness from the tahini that you likely wouldn’t be able to place if you didn’t know it was in there. 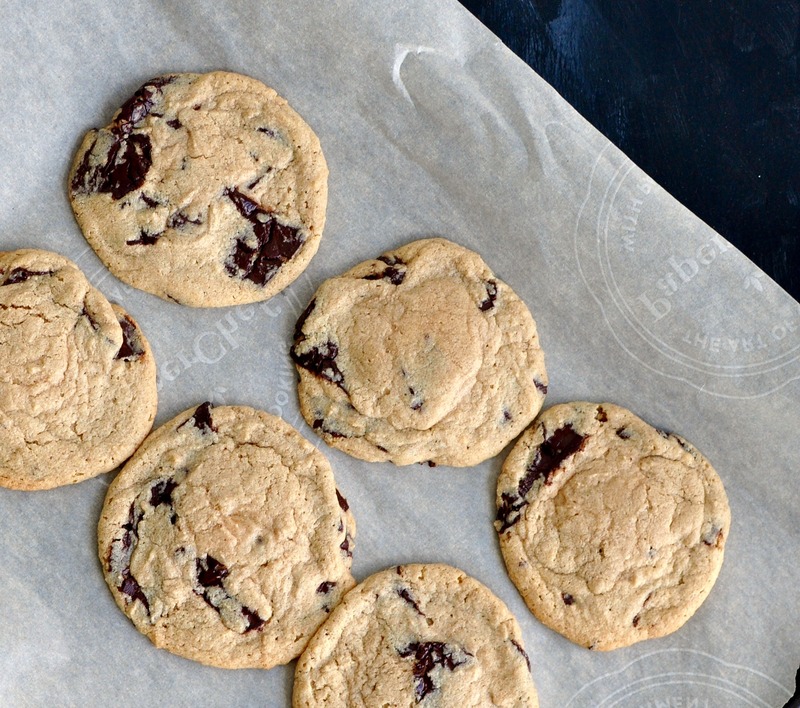 These are the ultimate, rich, dunk in a super cold glass of milk chocolate chip cookie. Barely adapted from My Name is Yeh. Keep in mind, these cookies require softened butter and a 12 hour rest in the freezer. Make sure that the cookies look under-baked when you take them out of the oven. They will be perfectly soft and chewy after resting for 20 minutes. These cookies are huge as is.You definitely need to leave at least 3 inches between the dough balls. They spread to a nice, thin cookie. I could only bake 6 at a time. Place butter, tahini and sugar in a large bowl. 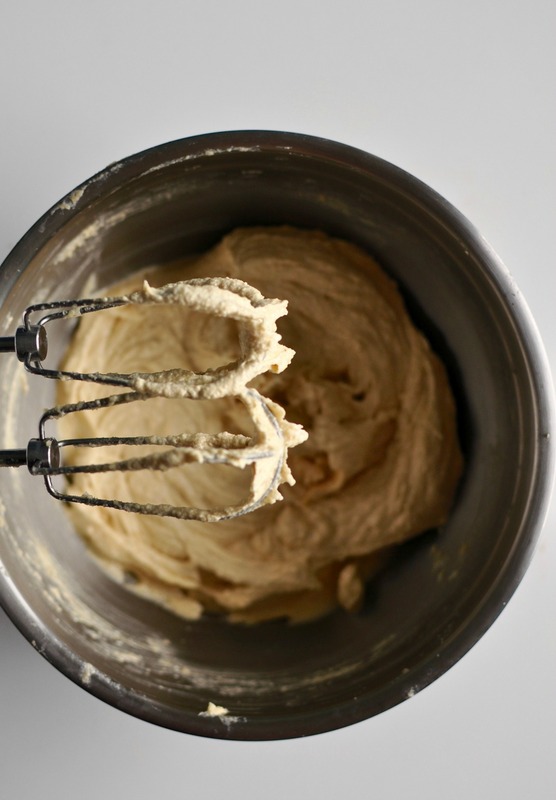 Using an electric mixer on medium speed, mix until light and fluffy (3-5 minutes). Add the egg and egg yolk and continue mixing for another 3-5 minutes. Scraping down the sides of the bowl as you go (to make sure everything is evenly incorporated). Slowly add the dry ingredients into the wet mixture, mixing until just combined. Using a spatula, fold in chocolate chunks. Create dough balls using about 2 tablespoons of mixture (you should have 12 cookies, they will be really large when cooked though), placing the dough balls on a parchment lined baking tray. Cover the baking tray and cookie dough with plastic wrap and freeze overnight (at least 12 hours). When you are ready to bake the cookies, preheat oven to 325F. Bake cookies for about 15 minutes. They will look quite undercooked but will firm up when they cool down. Cool down on baking tray for at least 20 minutes.